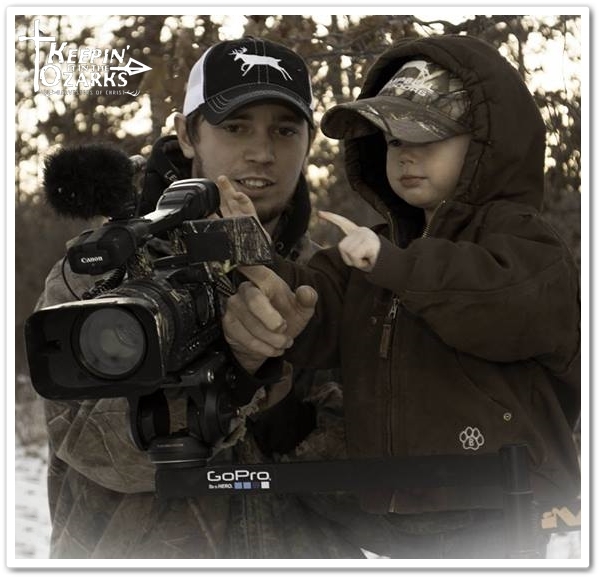 “Keepin’ It In The Ozarks” is an independent reality series produced by Pulaski County Missouri native, and avid outdoorsman, Justin Sapp. 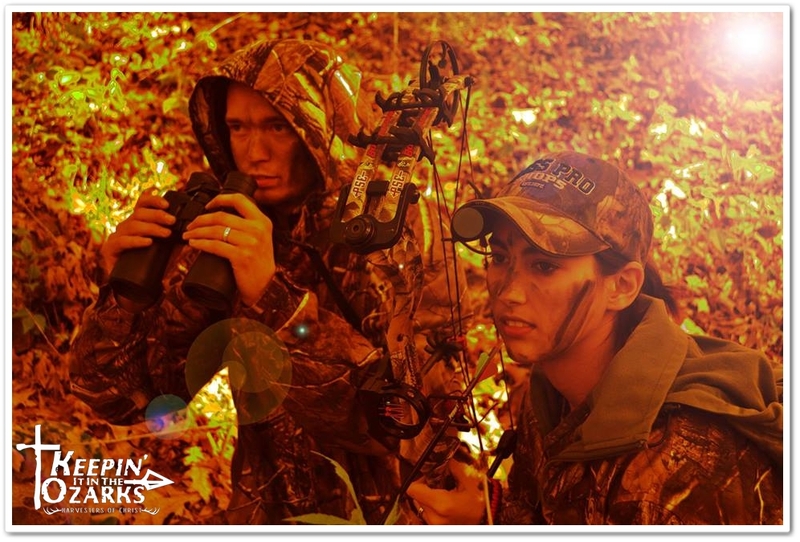 The show, filmed in Pulaski County and surrounding areas, documents the Sapp family’s hunting and outdoor experiences in the Ozark Mountains. The episodes are designed to be both entertaining and informative and cover a wide variety of outdoor related topics- including hunting, fishing, trapping, and enjoying God’s creation and the outdoors. New episodes of “Keepin It In The Ozarks” are released in high definition on their YouTube channel the 1st and 15th each month and can also be viewed on their website. You can follow Justin’s outdoor adventures on Facebook, Twitter, Instagram, and their blog. 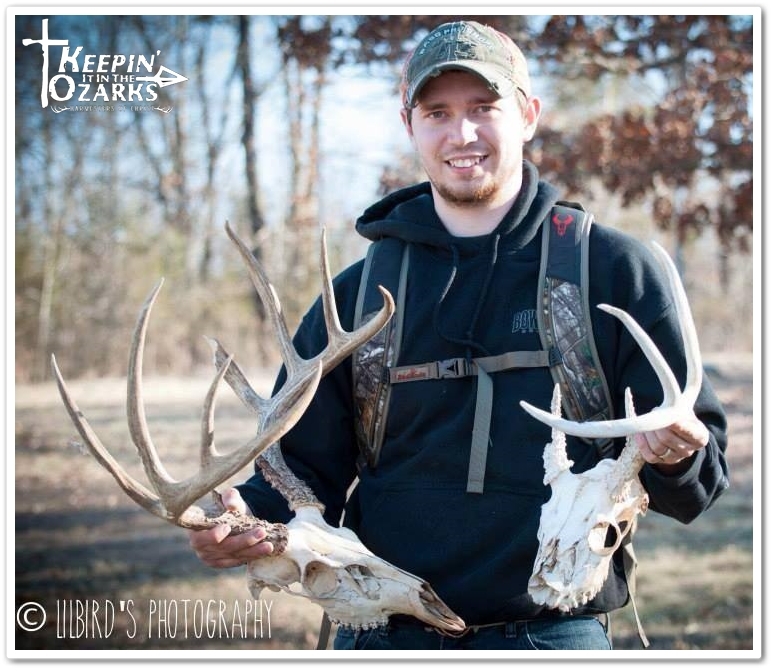 Pulaski County Tourism Bureau was able to meet with the show’s Executive Producer & Host, Justin Sapp, to get his thoughts on beards, frog gigging, antler point restrictions in Pulaski County, Missouri- and more! Pulaski County Tourism Bureau: Just to get this question out of the way, I have to ask this- Will you be growing a beard like the Duck Dynasty guys? Justin Sapp: If I could grow a beard like that I would! JS: I use both but if i had to choose one it would be a bow! JS: Canoe, I’m afraid of getting stuck upside down in a kayak! PCTB: Has hunting/fishing/outdoors always been a part of your life? JS: I can’t remember a time I wasn’t in the woods or on the water. My wife would agree too! PCTB: What is your earliest memory of hunting in Pulaski County? JS: My Dad started taking me with him on his hunting trips to the Mark Twain National Forest when I was 8. PCTB: What is your favorite public fishing spot in Pulaski County? JS: I really like fishing at the Boiling Spring Campground near Dixon! PCTB: If a visitor from Arkansas, or anywhere else, asked you for a publicly accessible place to go frog gigging, where would you send them to? JS: Frogging is good in a canoe by Steckels Bridge in front of the Cave Restaurant near Richland! Actually, anywhere on the Gasconade is fun to frog on! PCTB: Why should someone travel to Pulaski County to deer hunt? JS: Deer herd and public access. Between Ft Leonard Wood and the Mark Twain National Forest, Pulaski county is not lacking in either category there! After the hunt, there is plenty of great Breakfast cafes around. We like to warm up and eat breakfast at the Oasis truck stop on 133 exit! PCTB: Are there special considerations that one should take before hunting on Fort Leonard Wood or in the Mark Twain National Forest? JS: Fort Leonard Wood does have special regulations for hunting. Since I cannot film my hunts out there I do not venture out to Ft Wood that much although I’m probably missing out on the best hunting in Pulaski County! Mark Twain National forest is public walk -in land and you just need to be up to date with your hunting licenses and regulations for the game you are after! PCTB: In layman’s terms please tell us how you think the 4 point antler restriction could improve hunting in Pulaski County. JS: The Antler point Restrictions have already helped! I have noticed more mature bucks each year in Pulaski County.. We are surrounded by non APR (antler Point restriction) counties , so if you want a better chance at a mature deer then Pulaski County is the county to be hunting in! Putting deer herd and mature deer aside, I like the APR because it makes hunters slow down and look over the animal before pulling the trigger. I’m sure it has saved someone from injury or worse, death, from an unfortunate hunting accident! Safety First. PCTB: Why should someone travel to Pulaski County to coyote hunt? JS: Coyotes have been increasing in population for a while now. Our ground nesting birds and rabbits are struggling in population because of them. Most farmers around here are happy to allow you to call some Coyotes in for a dirt nap! Pulaski County has the Gasconade and the Piney rivers- river bottom land is great for calling in those Yotes ! PCTB: Why should someone travel to Pulaski County to hunt for other game? JS: Our turkey population is doing great this year! After a few bad hatches from floods and predator problems our population was dwindling. We have now had some great hatches and it seems as if everyone is into removing predators now, so the Turkey population is looking great for this year! JS: My favorite Spring turkey hunt was last year. After harvesting my largest Gobbler to date , I took my wife the first weekend and she harvested her first Gobbler! We had four big Gobblers run into the decoys and she shot the one that I didn’t have on camera but it was an exciting hunt! PCTB: What about the feral hogs? JS: Feral hogs are mostly on the Fort. I have personally never seen one while hunting. There are only a handful of people who know where they normally make their home and they are tight lipped about the hogs location. Eventually, I believe the population will get out of control and begin venturing farther off Ft Wood. If you get lucky you may run into some off the South Gate of the Fort. PCTB: Do you have any black powder experience? JS: Oh Yeah, I love hunting with my Muzzleloader! Sometimes I pack it with me during Rifle season! Again, Slowing down and enjoying Gods creation in the outdoors is what this is all about! Slow down, make your one shot count! PCTB: Have you ever trout fished the Roubidoux in downtown Waynesville? I love fishing the Roubidoux and I am usually successful. They have a concrete ramp for people that are disabled! My wife can walk to the Waynesville park while I fish so that is a plus! The spring is also stocked with rainbow trout on a regular basis so it makes for an exciting trip every time! PCTB: Was Robin a huntress/outdoorswoman before you met? JS: My wife, Robin, is the biggest city girl I have ever met. I’m slowly converting her to a huntress but I never make her to hunt or fish if she does not want to. This year she shot her first turkey and Buck!! I’m a proud husband, and truth be told , I would not be doing what I am today without her. She is the biggest technology freak I have met, and she is the one that got me interested into video production! JS: What is the most interesting find that you have stumbled across in the woods? PCTB: What other projects have you worked on before deciding to launch “Keepin’ It In The Ozarks”? JS: I’ve been with Ozark Traditions TV and Bowdacious Outdoors TV. Both shows got me where I am today and now it’s time to take the path God is leading me! JS: I have a strong desire to get people into the REAL Outdoors. We want to not only be entertaining but informative! Killing a mature buck is exciting but I would rather film a kid shooting their first deer and their excitement! It is not about killing an animal. In the end it is about the journey of the Hunt, family, friends, and God. The Outdoors “saved” me! God has a plan, and I’m going to follow! PCTB: How often will new episodes of “Keepin’ It In The Ozarks” be released? We release an episode on the First and Fifteenth of every month.. The episode on the Fifteenth will be about what we are doing to manage our hunting property for that past month. It should be very informative to local people planting food plots and managing their deer herd. We are excited for 2015! PCTB: Will you be at any outdoors shows so people can meet and visit with you? JS: We will be at the Outdoor Sportsmans Show On February 20th and 21st at the St. Robert Community Center! This August we will be at a few Hunting expos again! Come on out, We love to hear your hunting stories! *Editors Note- The Outdoor Sportsman Show scheduled for February 20th & 21st in Saint Robert, MO has been cancelled due to weather.